The 4th of July is here and you know what that means: fireworks, parades, and of course, fine horse jewelry. This year, we thought we’d go with a Red, White, and Blue theme and share some wonderful pieces of horse jewelry that were made right here in the USA! 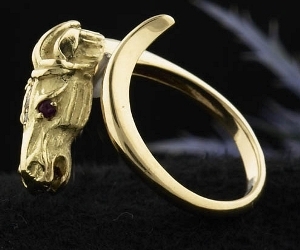 Red rubies shine in this 14K Gold Horse Head Ring. This ring was inspired by an estate piece that was so beautiful we had to have one of our master jewelery artisans recreate it! There are three tiny diamonds on the blaze to add just a little more sparkle. This is a very wearable ring that goes from the barn to the ballroom – classic styling and dynamic lines will get you lots of compliments. Makes a great gift for someone special – and don’t forget that you are special! White means diamonds! We love this classic equestrian essential, the 14K white gold and diamond horseshoe necklace. The horseshoe is a symbol that speaks to your love of horses and good luck. More than a quarter carat of diamonds shine on this beautiful necklace. The horseshoe is 5/8″ x 5/8″ – just large enough to make an impact without being too-too big. Made in the USA by our master jewelers. Measures approximately 17″ – very wearable. You’ll love this diamond horseshoe necklace. 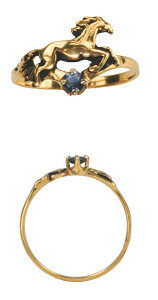 A beautiful blue sapphire is featured underneath a lovely running horse in one of our most popular rings. The sapphire is raised up, contained securely within 4 prongs. Fans of running horse jewelry just love this ring – the detailing is amazing with the flowing mane and tail. The 14K Gold Galloping Horse Ring is proudly made in the USA. Makes a great gift, and is available in both white and yellow gold. You can have this ring made with other stones as well – a great idea if you’re looking for a birthstone horse ring.